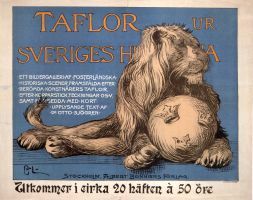 A sample of 254 swedish posters between 1897 to 1998 from the large collection of the swedish national library, with a list of designers and a 2 page summary. THE HISTORY OF the poster as an official bulletin and placard stretches back to the origin of printing techniques. Then, it's main purpose was to inform. It was first in the i8oo's, when one more and more started using illustrations, and then primarily color lithographs, that the character of the poster changed. Today, informing is still one of the main purposes of the poster, but the combination of text and pictures present the opportunity for a dif- ferent approach, and the poster has started more actively to influ- ence. In this way, its character has became both informative and manipulative. IN THE POSTER'S limited format, one should attract the passing observer and, in a short period of time, try to convey that which one has to say. The poster must, in other words, take space and be in focus, and it is precisely that which has influenced the poster's character and design through different periods. Focus is the initial theme and motif in the catalogue. One example is the poster shown on the cover where the eye works as a magnet, and it is difficult not to meet a direct glance. The situation is reversed and the intention is to get us to realize the importance of being seen - the most important function of the poster. ONE CHARACTERISTIC OF the poster is that it is strongly tied to its own time. The selection made for this catalogue is based upon timely posters from different time periods, the oldest being from 1705. It is easy to see only to the esthetic values when choosing post- ers, but the selection in the catalogue is based on a blend of aspects ranging from documentary to esthetical. Above all else, the poster must work - it must affect. Posters from the war years and political posters from referendums, where the purpose has been to inform, are intermixed with posters where artistic expression seems to be of primary concern. Often one finds oneself considering how well- crafted a poster is, and it's only after a little while that one notices what is actually being advertised. This catalogue can be said to be comprised of a representative selection of posters of varying character from the Royal Library's poster collection. IF THE POSTERS are allowed to speak for themselves, one can, by placing certain posters next to each other, get a polemic effect that in most cases was not intended from the beginning. Opinions and events and even the esthetic design of two posters can, in this way, cast commentary upon each other. Through this kind of arrangement, it is possible even more clearly to emphasize and reinforce the poster's message and get a better feeling for how times have changed. 254 POSTERS OUT of the collection's total number of 500'000 have been chosen for this catalogue. Every poster has been furnished with a commentary including its origins, the year it was made, size, printer and printing technique. The origins of a poster are often difficult to establish. Sometimes a foreign publisher provides a prototype for a poster which, in many cases, have then been adapted to the Swedish particulars. It is common that the posters are not signed. POSTERS IN SWEDEN deserve a better status. They often have a high artistic quality. The catalogue's first poster is entitled "Pictures out of Sweden's history" and is drawn by Carl Larsson. Perhaps that is the way we should regard these posters - as pictures. In time, the purpose of a poster changes. The message is no longer valid and the poster becomes a decoration and, as such, its value increases abroad. That is a trend that is certain to affect the value of Swedish posters in the future. It is hoped that this catalogue shall convey the breadth that exists in the traditions of the Swedish poster. Pictures from the traveling exhibition "I Blikfanget"